This tapestry "Royal Hunt" portrays King Louis XIV’s victory over the Spanish in Flanders in 1667. Based on the originals by Flemish painter Frans Van der Meulen (1632-1690), produced works depicting King Louis XIV, including the Seige of Besancon, on horseback. Indeed, many of his works specialized in horses and landscapes. Here we see King Louis XIV and his noblemen in the countryside in elaborate garments. The foliage and flowers are rendered in superb detail, a hallmark of the design of verdures from this era. This piece is filled with extraordinary artistry and detail. 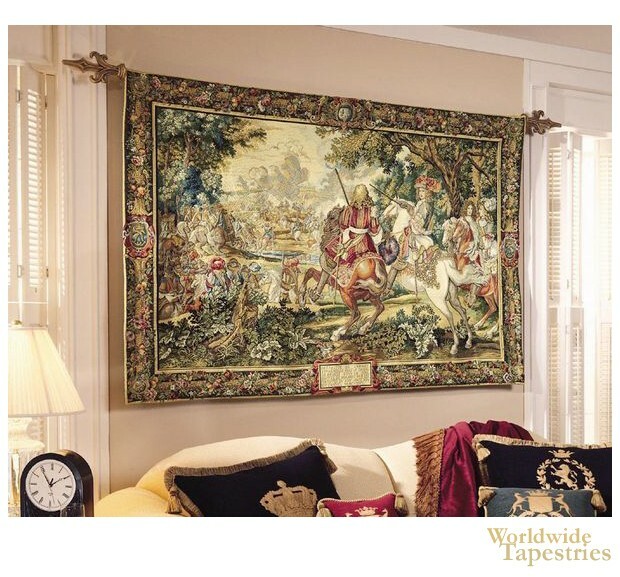 Full of elegance, this "Royal Hunt" tapestry is backed with a lining and has a tunnel for easy hanging. Note: tapestry rod, where pictured, is not included in the price. Dimensions: W 42" x H 27"
Dimensions: W 79" x H 54"